DRIVING DIRECTIONS to McCown-Cole Mill from 147 N & 15/501 N: take Exit 16A off 147 N or Exit 108D off 15/501 N. The exit ramp for 147 will merge into Exit 108D, stay in your lane. If you are coming from 15/501, get in the right lane. As you are coming up the exit ramp, stay in one of the two left lanes. At the top of the ramp, turn left onto Hillsborough Road. In 0.3 miles, turn right onto Cole Mill Road. Stay straight on Cole Mill for approximately 2.5 miles. Turn right onto Rivermont Road, which is just before the stoplight at Sparger Rd. If you cross the river, then you went too far. Rivermont Rd. will change to gravel in less than ½ mile. Slow down as the road bends to the right and widens. Park here along either road shoulder. The physical address is 3933 Rivermont Road, Durham NC 27712. Stay on Cole Mill Road for another 0.5 miles (past Rivermont Rd.) and cross the bridge over the river. Slow down and park on the road shoulder on either side of the road. The physical address is 4201 Cole Mill Road, Durham NC 27712. After crossing the Cole Mill Road bridge, continue north to the stoplight. Turn left onto Old Cole Mill Road. Stay straight to enter the Cole Mill Access of Eno River State Park. This is the only parking option with restrooms and designated parking spots. The physical address is 4300 Old Cole Mill Road, Durham NC 27712; if this address does not appear in your GPS, then use this intersection—Eno Woods Trail and Old Cole Mill Road. The park will be straight ahead on Old Cole Mill Rd. DRIVING DIRECTIONS to McCown-Cole Mill from I-85, Exit 173: at the bottom of the ramp, turn right and head north on Cole Mill Road away from Hillsborough Road. Follow the directions above beginning with “Stay straight on Cole Mill Road” in the first paragraph. HIKING DIRECTIONS to McCown-Cole Mill from the Pump Station parking at the top of the hill along Rivermont Road: take the Pump Station Trail (red dots) straight. You will head downhill toward the river. Once you reach the river, turn left at the intersection with the Mountains-to-Sea Trail/Laurel Bluffs Trail (white dots/yellow dots). Follow this trail upriver. In approximately 0.6 miles, you will come to the Cole Mill Road bridge. 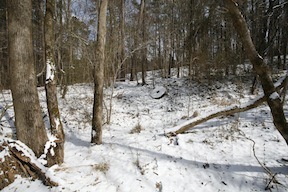 About 200 yards after the bridge, you will come to a wooden footbridge over the drainage for the McCown-Cole spring. Cross the footbridge and turn left off-trail. Follow the ditch to the springhouse. 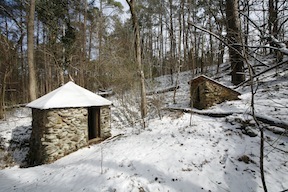 From the springhouse, turn right and follow along the bottom of the hillside, upriver. In approximately 150 feet, you will come to the mill site. Look for a tree with three yellow stripes and a flat area. The mill sat atop this flat area. Look toward the river; you will see a drop-off and a depression at the bottom. This is where the waterwheel turned. From here, make your way back to the MST/Laurel Bluffs Trail and head upriver. In 50 yards on the left side of the trail, you will come to a large rock with a flat face and some vertical striping. Here, you are entering the millrace, where water was once diverted from the river to the mill. In approximately 120 feet, the trail will turn left and head uphill out of the race. Stop before heading uphill and look straight ahead; the large rock outcrop you see was one of the footings for the milldam that stretched across the river. Turn around and head back toward the Cole Mill Road bridge. The round-trip hike from the Pump Station parking is approximately 2-2.5 miles, depending on how much exploring you do! HIKING DIRECTIONS to McCown-Cole Mill from the road shoulder parking at the Cole Mill Road bridge: after securing your vehicle, you have to safely cross the bridge on foot. USE EXTREME CAUTION—there is not much room between you and the cars, which are driving at a high rate of speed! We recommend crossing on the east side (downriver side) of the bridge, so you can see the oncoming traffic. Once safely on the other side, follow the guardrail. Circle around the end of the guardrail and head back down the gentle slope to the river. You may have to do a little bushwhacking while watching for thorns. You will come to the Mountains-to-Sea Trail/Laurel Bluffs Trail (white dots/yellow dots). Turn left and head upriver under the Cole Mill Road bridge. Follow the directions above beginning with “About 200 yards after the bridge” in the second paragraph. The round-trip hike from the Cole Mill Road bridge roadside parking is less than 0.5 miles. 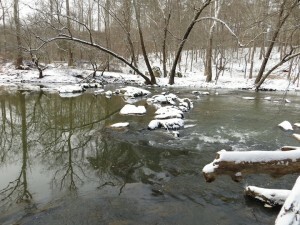 HIKING DIRECTIONS to McCown-Cole Mill from the Cole Mill Access parking lot: secure your vehicle and walk along the parking lot toward the river. When you reach the end of the paved access, you will see a wayside display overlooking the river. Turn left here and take the Pea Creek Trail downriver toward the Cole Mill Road bridge. Just before you pass under the bridge, take the stairs on your left up the embankment. At the top of the stairs, safely cross the road. Follow the above directions beginning with “USE EXTREME CAUTION.” The round-trip from the Cole Mill Access parking area is slightly over one mile.